Can You Eat Meat And Still Be Healthy? Where Do I Learn More About Selecting AND Cooking Good Meat ? In a big sauce pot (8 quart) cook vegetables and drain. In 6 qt. saucepan melt butter on medium heat. Add onion; cook and stir 5 minutes or until tender. Add flour; cook 1 minute or until bubbly. Stir in milk and bring to a boil. Reduce heat to medium-low. Add drained vegetables and cheese. Stir often until cheese is melted. It can burn if not stirred. Add pepper and salt when ready to eat. This is a good soup for the family. The kids LOVE it and I love that they are eating vegetables! In a large saucepan cook beef and onion on medium heat until beef no longer pink; drain. Return to pan add soups, water and tomatoes. Cook uncovered over low-medium heat depending on how long until you eat. I also add some basil. oregano, and garlic to make it taste more homemade. I’ve even added 1 cup of small shell pasta and let it cook for 10 minutes with everything. Let it cook until heated through if you don’t add more uncooked pasta. Just requires more time if add more pasta. This is one of my husband’s favorite winter soups. I will fix it when my son’s at school because it’s not one of his favorites. While clams are draining, put soups. butter,and milk in large saucepan on medium heat. Stir and mix well. 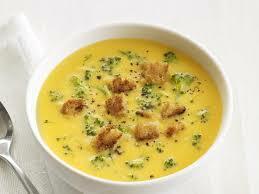 (Can mix soups in pan then add milk.) Add clams to heat thoroughly. Sprinkle with pepper before serving. When I serve it, I let everyone sprinkle oyster crackers over the soup in their bowls. This soup my daughter asks for often in the winter. I’m sure she will ask for the recipe now that she is at college! That is my favorite soup. I have several ways I make it. I think it has to have 4 main ingredients beef/sausage, beans, tomatoes/juice and spices and then I tend to do whatever. Brown beef and onion until meat is no longer pink; drain. Add to 4 quart crock pot. Add beans and tomato juice. May not use all of juice if you want a red beer. Add chili powder (amount depends on taste). Stir occasionally. Put lid on crock pot set to low for overnight and switch to high in the morning if want for noon. Leave on low if want the next night. Serve with shredded cheddar cheese and soup crackers. Brown ground beef and onion until beef is no longer pink. Drain and add to crock pot. Add beans, enough tomato juice to cover the ingredients in crock pot. Add chili packet and put on. You decide low or high depending on amount of tomato juice and length of time before you want to eat. Serve with soup crackers and shredded cheddar cheese. Brown beef, sausage, and onion in large skillet; drain. Put in crock pot. Put 1 Tbsp. oil in skillet and add peppers. Stir and cook until softened. Add to crock pot when done. Add both cans of tomatoes, soup, beans, chili powder, salt, and pepper to crock pot and stir. Add water if needed. Put lid on crock pot and turn on high for 3-4 hours. Serve with shredded cheddar cheese and soup crackers. Tip: If it is a little too hot for your taste buds, cut the chili powder amount down or add sour cream to the bowl when you serve it. I call this compromise chili because my daughter doesn’t like beans. 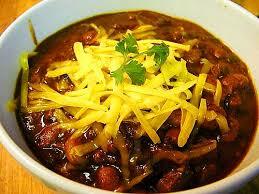 When I found this recipe I added 1 can of beans and my daughter can handle it.To me chili isn’t chili WITHOUT beans. Add first 7 ingredients to sprayed crock pot. I suggest you cut up the stewed tomatoes into smaller pieces when put in crock pot. Mix well. Cover and cook on low 4 hours or high for 2 hours. Increase or decrease water amount to your liking. Refrigerate leftovers. I make this in a regular size crock pot and it will serve my family 2 or 3 times. ,Serving suggestions: Line serving bowls with tortilla chips, ladle soup on top, sprinkle with shredded cheese and sour cream depending on personal preferences. Enjoy! I’ve also made a box of corn muffins and served with it also!